The Translation Layer is the first of a three-paper series titled Increasing the Business Impact of Customer Insights and Analytics. 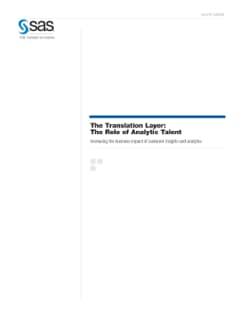 The translation layer is defined as the role that analytical people play, or ought to play, within organizations to bridge the gap between information and powerful business applications. This paper illustrates why the analytics community must evolve to increase the impact they have on the organizations where they work.